During the big yo-yo boom of the 1990’s, yo-yo’s and kite stores went hand in hand. While it was nearly impossible to find any transaxle yo-yos in most chain toy stores, kite stores often had a full rack or display case of the hottest new yo-yos. So it is little surprise then that a kite company would try to get into the yo-yo game. Revolution Kites, known for their fantastic quad line kites, stepped into the yo-yo market with the Rev-G in 2000. This was the first (and possibly only) carbon fiber yo-yo around. Due to it’s light weight and high strength, carbon fiber is common material for producing kites but we probably never saw it used for yo-yos due to it’s complex manufacturing process. Working with carbon fiber allowed Revolution to build a yo-yo with very little inner weight. 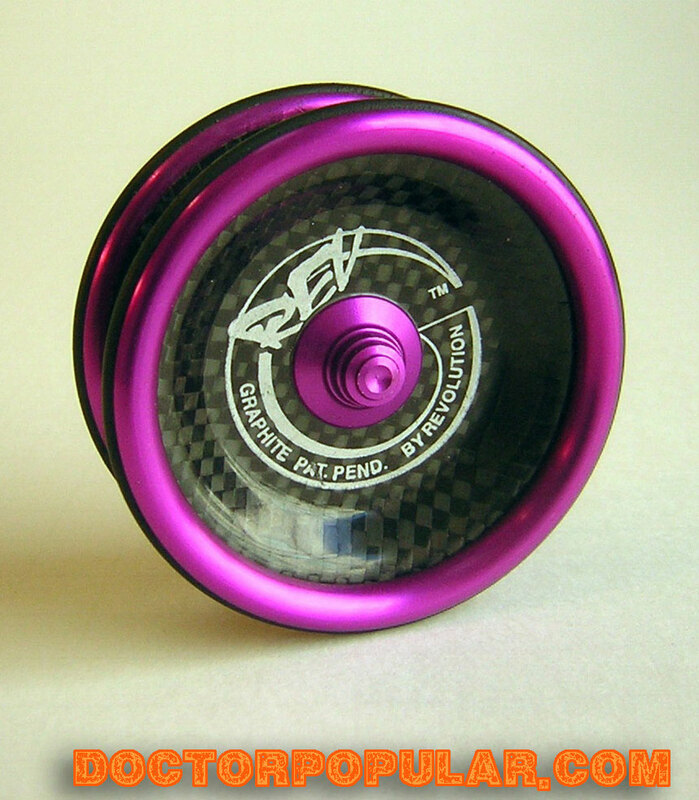 In fact I believe more than %75 of the yo-yos weight is in it’s outer rims (the pinkish-purple part), but I can’t find anywhere that lists the specific rim to hub weight ratio right now. Yo-yo companies are always trying to pack in more rim weight without making their yo-yo too heavy, but at 53.6 grams, I don’t think anyone has a higher rim to weight ratio than the Rev G.
It should also be noted that, like the Doble Titania, the Rev G was sold with a adjustable finger loop sleeve. Unlike the finger loop on the Titania, Revolution’s sleeve slipped over cotton yo-yo strings. Revolution patented their finger sleeve along with their “ultra performance modular yo-yo” in 2000. So what stopped the revolution? Their yo-yo design was just to weird and cumbersome. The yo-yo’s outer diameter was very large, while it’s gap was comparatively small making it awkward to hold. The yo-yo just didn’t have the smoothness of competitors such as the Bumblebee GT and the SuperYo Renegade. Do I think that a carbon fiber yo-yo could ever be successful? Sure, why not? But given the popularity of most aluminum yo-yos, I think a company attempting to design a carbon fiber yo-yo should stick away from novel shapes and try to work more within the realms of a the more common yo-yo. Imagine a carbon fiber Samurai or a carbon fiber hubbed YoYoJam with celcon weight rings. Revolution was not the only kite company to jump into the yo-yo fray. Go Fly a Kite came out with the a Russell with their name on it that is still available, and Spectrastar came out with a line of novelty yo-yos (Yup, Sepctrastar was originally a kite company. Now it’s not even a company any more). Revolution never made the CF to my knowledge (Carbon Fiber rods were a key to their kites success). I have wondered over the years if this yo-yo was designed by the CF company they used, and if they just distributed it. In any event, this was one of the weirder products caused by the influence of Alan Nagio.